At West Coast Solar, we believe the future of energy is in renewable energy sources like wind, solar, hydro, geothermal, and more. This is why we’re so excited to see the state of California continuing its commitment to move toward cleaner, more efficient energy consumption. 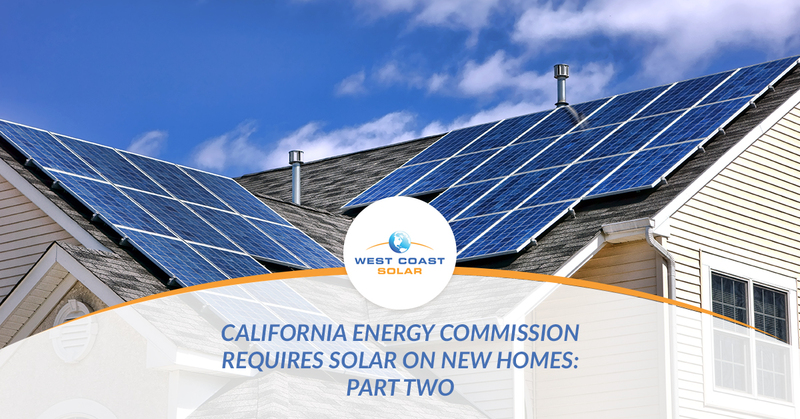 On May 9, 2018, the California Energy Commission approved the new 2019 Building Energy Efficiency Standards, which include the requirement of photovoltaic solar systems to be installed on newly constructed homes across Sacramento starting in 2020. In part one, we shared an overview of the 2019 standards and answered two common questions about the new standards. In this post, we’ll answer three more questions regarding the new standards and discuss why making the switch to solar is so important. If you’re ready to discuss installing solar on your home now, give us a call today! Otherwise, continue reading to learn more. Will the new standards achieve zero net energy? The new 2019 standards are a big next step toward achieving zero net energy. Homes built in 2020 and beyond will be highly energy efficient and use renewable energy to meet their annual energy consumption needs. Various technologies like demand-response applications will help manage the use of energy throughout the home. Voluntary additions to homes will offer a way to shift energy use from peak hours to non-peak hours, reducing the cost of energy from the grid and increasing the use of photovoltaic produce energy. The California Energy Commission set energy-reduction goals for residential and commercial buildings back in 2008. These goals were to get closer, if not achieve, zero net energy by 2020 for homes and by 2030 for commercial buildings. The update to the 2019 Building Efficiency Standards are just another step closer to zero net energy. Since 2008, California’s energy landscape has changed substantially. Two important policies have been pushing renewable energy to be used in general: the Renewable Portfolio Standard (RPS) and Net Energy Metering Rules (NEM). The Renewable Portfolio Standards regulate and mandate that a percentage of all energy production be from renewable energy sources like solar, wind, biomass, and geothermal. Currently, the requirement requires utilities to have at least 50 percent of their resources come from renewable sources by 2030. The Net Energy Metering Rules limit residential rooftop solar systems from selling excess power back to the grid. Although homeowners can sell energy back to the grid, it is at a reduced rate. The ultimate goal is to have a homeowner’s solar panels produce just enough energy for their annual home use throughout the year. These two policies have directly affected the value of renewable energy production like solar power systems, which results in the fine-tuning of residential renewable energy production to not exceed expected annual consumption. What’s the cost addition to new homes under the 2019 standards? The California Energy Commission is excited to share its estimated savings against the additional costs to new homes under the 2019 standards. The new standards will raise new home prices about $10,000, but the savings in energy efficiency will result in almost $20,000 over 30 years. For example, this results in about a $40 per month increase in home cost based on a 30-year mortgage, but the homeowner will see upwards of nearly $85 per month in energy savings on lighting, cooling, and heating bills. Why go solar if you live in Sacramento? Are you a homeowner in Sacramento? It’s time to go solar. The reasons to go solar are simple, but making the switch to solar power has a huge impact on more than just your utility bills. When you install solar panels on your roof, you reduce your carbon emissions, help the environment, lower your utility bills, and invest in a safe, high-return opportunity. Although the initial cost of solar may deter people, it’s now more affordable than ever with various financing options and the Solar Investment Tax Credit (ITC). Take advantage of the evolving solar landscape now! Call West Coast Solar today to make the switch to solar power! At West Coast Solar, we believe in the future of renewable energy. Not only do you benefit from using renewable energy sources, but the entire world benefits from your decision. When home utilities result in the emission of nearly 20 metric tons annually, we think it’s time to make a change. If you’re ready to discuss how you can install solar on your Sacramento home, give us a call today!